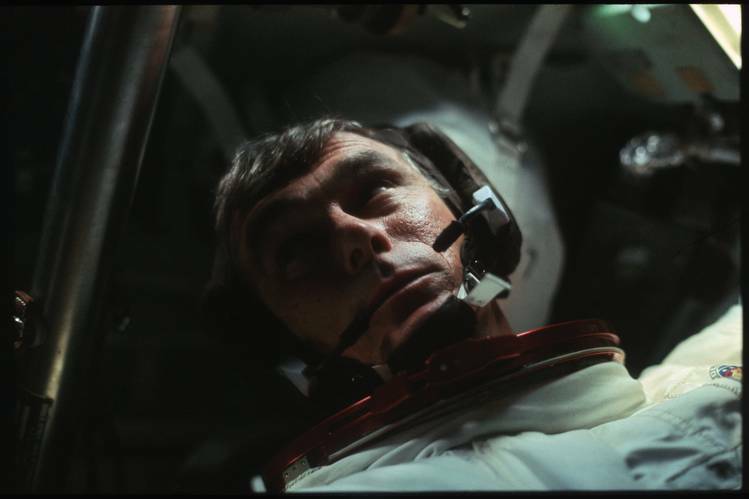 Cernan was very good for the cause of space exploration, keeping the memory of Apollo alive, never seeming to tire when retelling the same stories of his three days on the moon at the Taurus-Littrow landing site, no doubt for thousands of times. He’d talk of fixing the fender on the lunar rover with a moon-chart and some duct-tape and his desire to hand his title “Last Man on the Moon” to someone else. I was hoping that he would live enough to pass the mantle. He will be missed. Apollo 17 gave us some of my favorite lunar imagery. This is one of the most beautifully composed of the lunar images. A dramatic angle that really tells the story in a single square photo. In this case, it was Cernan who handled the camera with Jack Schmitt posing. Since the landing site was the most northern one, the Earth was relatively low on the horizon so made this kind of shot possible without Cernan having to get down on his back. None of the early space flights carried flashes for the cameras, and as photography was generally meant only to document the stuff outside the spacecraft, and not inside, very few in cabin shots were ever taken. But, since there was no strobe, the images are illuminated with natural light, frequently making both beautiful and sublime memories of the mission. Here is Cernan after one of the moonwalks, caked with moon dust, likely exhausted and elated at the same time and probably wishing for a beer and shower right about then. And another existing light shot back in the command module.